Learn how to think green! 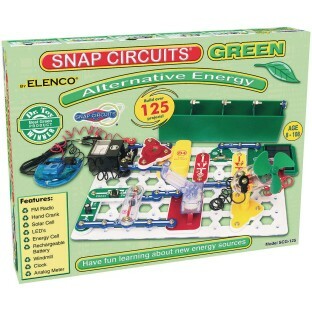 Learn about energy sources and how to think green. Build over 125 projects using the flexibility of our award-winning Snap Circuits®. Have loads of fun learning about environmentally friendly energy and how the electricity in their home works. Includes full-color manual with over 100 pages and separate educational manual. The included educational manual will explain all the forms of environmentally friendly energy including: geothermal, hydrogen fuel cells, wind, solar, tidal, hydro, and others. Contains over 40 parts. Features hand crank, solar cell, FM radio, energy compartment, rechargeable battery, windmill, and clock analog meter.